The Digital Audio Recorder is a cutting edge tool used to gather and store audio evidence, be it on your person, during your phone calls, or during your room conversations. Digital Audio Recorders have surpassed audio cassette voice recorders with many intricate and useful features that bring audio note taking to unequaled levels, especially when this unique Digital Audio Recorder can store over 500 hours of voice conversations internally. This 2GB Digital Audio Recorder can record your personal and business meetings and this is helpful because anyone in a meeting sometimes regrets not recording that meeting. It also records your phone calls. 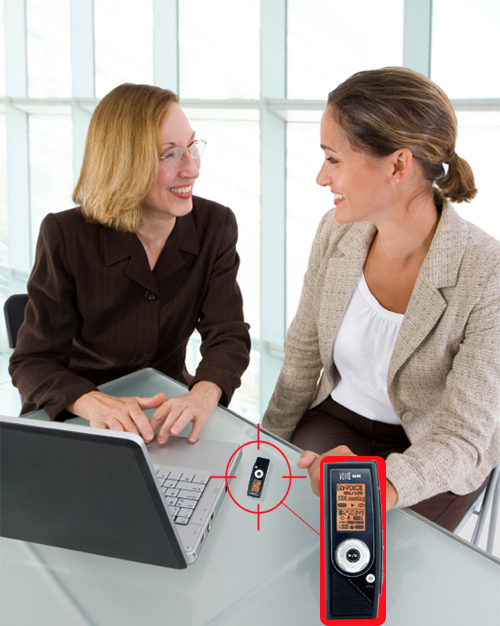 The 2GB Digital Audio Recorder eliminates lost information by recording conversations and storing them. The Digital Audio Recorder lets you play them back, save them as files, email them, archive them on your computer, etc. Some people cannot remember every detail during a phone conversation. Some people wish they had a Digital Audio Recorder to keep track of what they said during their phone calls. Unlike other Digital Audio Recorders, the 2GB Audio Recorder can store an enormous volume of conversations. Information Stamping: This means the Digital Audio Recorder can put information on each recording to help you identify each recording, such as the time, date, duration of recording (its size), so that you will be able to find and locate each audio conversation you record. This information stamp is part of an Automatic file and Automatic folder advance feature. This means you do not have to go through all of your recordings one by one to locate a recording. Recorded files are indexed, making them easier to find. Cellular Recorder: Telephone Connection Interface for Cell Phones (Nokia phone users would need an optional adaptor). Recording Quality: You can choose multiple recording quality levels, with a setting at near CD voice or audio quality. Most Digital Audio Recorders do not have this type of sound quality. AC Power: AC adaptor supplied in order to operate the Digital Audio Recorder endlessly without using battery power. Timer Program: You can set the Digital Audio Recorder to activate at various times so there is no on the spot fussing with the recorder. Playback Quality: You can listen to recordings in high or low speeds, without hearing a cartoon talking sound on playback. MP3 & FM: The Digital Audio Recorder comes with a built in MP3 Player & an FM Tuner. Equalizer: A Built-in equalizer with 5 bands, bass, & treble settings for customized sound. Q: Is the digital audio recorder discreet? A: Yes. Our digital audio recorder can be carried in your pocket, be it a jacket, shirt, or on your person without drawing much attention. Q: Why do some digital audio recorders store few hours of conversations while others store more? Answer 1: All digital audio recorders have the ability to record in a standard 'speed' mode and a reduced 'speed' mode. The Standard speed produces excellent sound quality. The Reduced speed produces sound quality that is not equal to standard, but increases the recording time by 100%. Answer 2: Some digital audio recorders have more memory than others, increasing the volume of audio data to be stored. A: Voice conversations, room conversations, phone conversations (connected to a phone or line correctly), interviews, meetings, etc. Q: What is the best place to use the digital audio recorder? A: Generally, an uncrowded, quiet room is recommended. If the audio recorder is taken to a stadium, auditorium, or area where there is background noise, there might be a decrease in the sound quality. Q: How can recordings be transferred to other people? A: All digital audio recorders come with a USB connection and software so that you may take your conversation, download it to your computer, and from that point, you should be able to save a copy and email it to others, or save a copy onto a cd rom or external drive such as a flash drive.